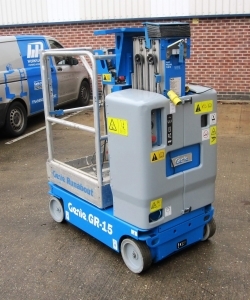 Genie Runabout Vertical Mast Lifts are compact, narrow, low weight machines with zero inside turning radius, and none marking solid rubber tyres. Usable on gradients is drivable when elevated. Platform controls are equipped with on-board diagnostics and proportional lift and drive controls provide a smooth ride. The Genie Runabout Contractor (GRC) is suitable for use on construction sites and has a tube-in-tube telescoping mast and a steel platform for durability in rougher environments. Self-propelled personnel lift with one person occupancy, an extending platform and a 6.47m working height. Ideal work warehouse work and supplied with a 6 month warranty. Genie GR15 with only 157 hours on the clock and supplied with a 6 month warranty. Ideal for warehouse work & extending platform is standard. Compact one person indoor use machine that is driveable at the full 6.47m working height. Supplied with a 6 month warranty and new LOLER. 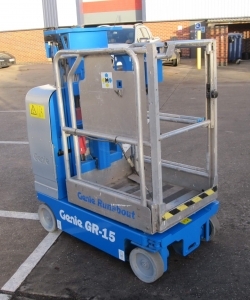 Very compact Genie GR-15 runabout, great for warehouse and retail work. Supplied with new LOLER cert and 6 month warranty. This Genie GR15 has only 215 hours on the clock and is ideal for stock picking in a warehouse or retail environment. Supplied with 6 month LOLER and 6 month warranty. Working in a warehouse and looking for something to pick stock, then take a look at the Genie GR15. This unit is supplied fully serviced and with a 6 month warranty.